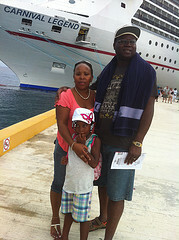 My family chose touring Cozumel as the thing to do ashore on our most recent Carnival Paradise cruise. 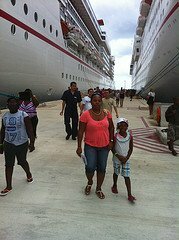 The 5-day cruise on Carnival Paradise sailed from Tampa, Florida and visited two ports of call in the Western Caribbean – Grand Cayman, Cayman Islands and Cozumel, Mexico. As far as shore excursions go, my family generally waits until we get off the ship in a respective port of call, before deciding what to do. We save by doing that. 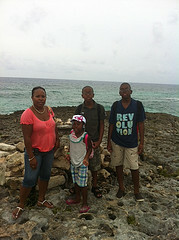 On this our 6th inclusive Caribbean cruise, we decided to tour Cozumel and visited a beach in the end. 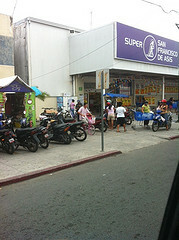 In fact, our initial plans called for just doing some shopping and then visiting the beach. However, upon checking out all the beach offers with some local tour companies waiting outside the main reception area at Puerta Maya, we found what was a great deal - $20 per person for touring Cozumel, and that included the beach stop. Unfortunately, I cannot recall the name of our driver or the company he worked for. 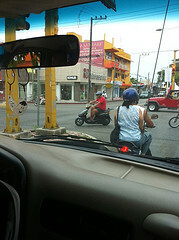 However, we got someone who was rather patient with us and who made a sterling effort to point things out as we drove the streets of Cozumel. We set off towards “Downtown” and were allowed to get out of the air-conditioned bus to check out the stores and street vendors’ stalls. There were many gift or souvenir items from which to choose. 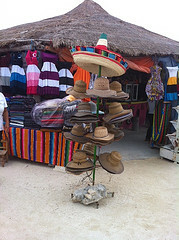 However, we did not buy much of anything because we realized that the prices were not better than those at Puerta Maya. Somehow, we thought that the prices away from the pier would be better. While some were, the things we had some interest in were not. So we decided to wait until we returned to Puerta Maya to buy our souvenirs. From checking out the shops and vendors, our driver offered to show us where the locals lived. It was obvious that the locals were modest people of modest means, based on the small houses we saw. 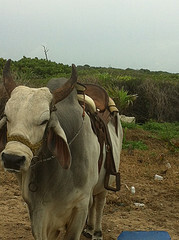 What impressed me most about the locals was the way they got around. It appeared that most people rode a motorcycle. Well, not most people, because some motorcycles had 2 or 3 people onboard. There were both men and women riders. We were impressed with how most locals traveled by motorbike. We continued our tour of Cozumel and went by two universities and even the entrance to a Mayan ruin. 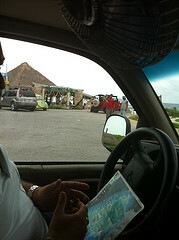 The Mayan ruin was along a 9 mile stretch of highway with many trees on both sides, which took us to a coastal highway. 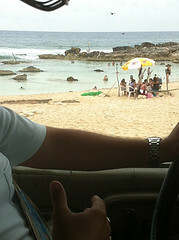 We had several miles of coastal driving, passing some young men holding an iguana. Our ride along the coast took us past some beautiful sceneries such as a hotel sitting on the edge of the water, and locals with a donkey and what appeared to be an ox, selling on the road. 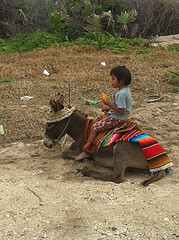 What appeared to be typical animal life in Cozumel - an ox and a donkey. We stopped at what appeared to be a popular location with a shop for food, a shop for souvenirs, restrooms, huge rocks by the water – perfect for pictures and a beach area surrounded by rocks. The water there was rough, but as we later realized, it would have made a better beach stop than where we went. Rough beach area on tour! Great place for photo on the tour! 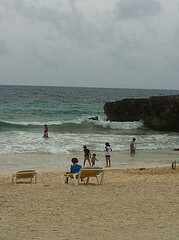 Our touring of Cozumel took us to the final stop before we returned to the ship. The place was called Ocean Beach. As you walk in you pass a nice pool and a hot-tub. 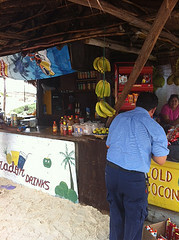 Then, there is a shop on the beach, serving Mexican foods. Lunch for us was fajitas and chicken tenders. Warning: They add 15% service charge to your bill. We were disappointed with the beach. It was a rough sea day and that may explain what we discovered – the water was not clean. It was more muddy than blue. Luckily for us, we were able to use the pool and hot-tub and that is what we did. We made the most of it and had a great time! 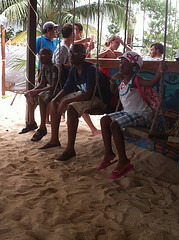 Kids swung while we waited for lunch. 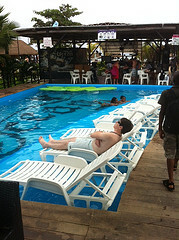 Before long, we had overstayed the 4 hours allotted for our tour of Cozumel. I got the family together and headed out to find our driver. He was not at all perturbed. So, after all, touring Cozumel turned out just right. The price was great and we got a taste of the island, people and even their food.